The National Council, Boy Scouts of America was organized Feb. 8th, 1910. It was later chartered by the U. S. Congress in June of 1916. During this year a few troops, from Rigby on the north to Shelley on the south were registered and received a charter. By 1922 Scouting was getting pretty well established all over the Nation. These units that were trying to carry on scouting now were registered and doing business directly with the National Council at 2 Park Ave. New York City, New York. By now a second class Council was trying to function under the leadership of D. W. Dinwoody as president and Dr. Jabez W. West as Commissioner. Scouting was growing in the Jefferson, Bonneville and Shelley area of Bingham Counties. By spring of 1924, there were seven troops in Jefferson County, four in Bonneville and five in the Shelley area of Bingham County, under the supervision of interested men such as D. W. Dinwoody, Dr. J. W. West, R. H. Snyder, D. F. Richards, George M. Scott, David Smith and Otto McCutcheon of Idaho Falls, O. H. Snow, J. R. Sayer, F. S. Johnson and Willard Adams of Rigby, and John E. Kelley, Randell L. Anderson, Willard Longhurst and Victor M. Kotter of the Shelley area and others who’s names we can’t recall. At this time the National Council decided to organize the Nation into Regions. Region 11 was formed out of Washington, Oregon, Idaho, Western Montana and Alaska. Organizing teams went throughout the Nation working within the 12 regions of the nation. This was for the purpose of getting more scouting to more boys. Areas within these regions were set up as Councils. April 24, 1924, a meeting of all interest in Boy Scout promotion was called to meet in the Methodist Church in Idaho Falls. Mr. Friedman, of the National Council of America was present. He explained the workings of organized councils in the Nation. He said, with the 16 troops and approximately 250 boys registered and the fine leadership that was in evidence, by all means a Council should be organized in this area. All present were very much in favor of this. First it was necessary to have a paid, trained executive in charge. This brought up the problem of finances. After some discussion it was voted on and agreed that the Rotary Club of Idaho Falls would raise $250 and the Boosters Club of Rigby would raise $150. Said funds to pay for a trial run. Dr. J. W. West was sponsor for Harold S. Alvord who was an Executive Scouter in Logan, Utah. He was hired. Dr. H. D. Judkin, of Idaho Falls volunteered half of his office space for the headquarters. This was in the Lamprecht Building. Dr. West’s office was in an adjoining room. This was carried out and organized Scouting was on its way in a first class council. The first officers of this council, gleaned from old records that could be found, were Raymond H. Snyder, President with the following Vice Presidents, Arthur Porter, George M. Scott, A. R. Chandler, Wm. L. Killpack and T. N. Hardy. D. F. Richards treasurer, Dr. West Commissioner and Harold S. Alvord Scout Executive. It was announced a full Scout uniform would be given to the scout who submitted a name for the Council, that was approved. Scoutmaster Vernon L. Strong suggested the name, Teton Peaks Council, which name was approved and adopted. He being a leader and not a boy scout, never received the uniform, but received a scout hat. 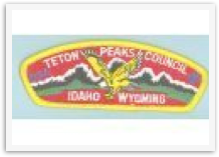 The following year, April of 1925, the Teton Peaks Council received its Charter as a First Class Council. The following area was set up to be the Council. The counties of Idaho, Teton, Fremont, Madison, Jefferson, Bonneville, Butte, Custer, Lemhi and the north portion of Bingham from Kimball north and Teton County, Wyoming. Approximately 23,000 square miles in area. The active scouting area was confined to Jefferson and Bonneville Counties and Shelley and nearby communities of Bingham County, with Idaho Falls being the hub where the Council Headquarters would be located. Soon the program spread into other areas, Teton, Fremont and Madison counties participating. Some time later troops were organized in Lost River, Salmon and Jackson. A permanent place for headquarters for the Council was very much needed. The budget had been worked out and set at $5,050 for the coming year. Bonneville County Commissioners said they would raise one half of the budget and provide office space for the Executive Staff. This was with the understanding that the headquarters and home of the executive was to be located in Idaho Falls. The Red Cross had recently moved out of room 204 in the Bonneville County Court House. The Commissioners consented to let the Council use this space for their headquarters, which was very much appreciated. Scouting in this part of Idaho took on a new perspective and Scout Leadership training got underway The first Scoutmaster’s training course was held in the basement of the court house in February 1925 with some very beneficial results. Among those attending, from this committee’s memory, were: Victor M. Kotter of Woodville, Wm. “Bill” Steel of Iona, Mahonri Brown of Milo, Rebuen C. Anderson of Ammon, Vernon L. Strong of Lincoln and maybe a dozen others. Competition became keen now among the many troops in the council and advancements and recognitions were noted. Vernon Strong, Scoutmaster of Troop 17, was the first to received the coveted Eagle Scout award. This was presented to him in 1926. The first annual meeting of the Council was held Oct. 14, 1926 at Rigby, it was a father’s and scout’s gathering. Oscar A. Kirkham, of Salt Lake was the speaker. St. Anthony, Rexburg, and Ashton asked for the privilege of joining the Council, they were readily accepted. The budget was set at $6,000. Scouting was really growing and the Teton Peaks Council was making history with the National Council of America. Scouting was gaining quite a momentum now, troops trying to out do each other in the many skills of scouting. The new Scout Executive, Harold S. Alvord was the man who knew how to organize and get the training for the troop leadership. It was decided to keep him as the Council Executive and try to make it as favorable for him as possible so he would stay. All the troop sin the council had been given a number to designate them by, such as Idaho Falls First Ward, Troop number 1, Troop number 6 went to the Idaho Falls Methodist Church, Troop 17 to the Lincoln troop, number 31 to the Woodville troop and so on. The National Council adopted Cub Scouting about 1928. The first Cub Pack in the Teton Peaks Council was organized in the East Side School at 14th and Higby Ave. In Idaho Falls. Prior to the organization of this pack, Robert Crowley and Jack D. Strong were registered as Lone Cub Scouts. In the early years of the Teton Peaks Council it was a struggle to raise the necessary finances to keep the Council functioning as it should. In 1933 it was about ready to fold up, but men like David Smith, D. F. Richards, Otto McCutheon, J. W. West and D. W. Dinwoody and a few others, with their foresight, and good judgement and management were able to get prejudice’s, indifferences and financial problems under control and from then on the Council moved forward. Eight years later through the efforts of these men, Idaho was rated Second in the Nation for effective Scouting, with the Teton Peaks Council rating first in Idaho. Eli Kobayashi, Institutional Representative - 1975, also Hall of Fame.